The controversial Sampur coal power plant funded by India has been cancelled, the Attorney General’s Department informed the Supreme Court today. 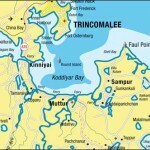 Quoting the Secretary to the Ministry of Power and Renewable Energy, the Attorney General’s Department informed the court that the coal power plant will not be constructed in Sampur, Trincomalee. This was announced when the Fundamental Rights Application filed by Environmental Foundation Limited (EFL) was taken up. EFL has objecting to the use of coal for the 500 MW power plant due to environmental concerns. The petition had cited long term health impact to the people living in the area, and the long term environmental repercussions along with certain discrepancies to the Environmental Assessment Report (EAR). The power plant which was to be built by India’s state-owned National Thermal Power Corporation India was to be built at an estimated cost of US$ 600 million. The MoU for the first 500 MW phase was signed in December 2006, between the Government of Sri Lanka, Ceylon Electricity Board and the National Thermal Power Corporation India. The Power Purchase Agreement, Implementation Agreement, BOI Agreement, Land Lease Agreement and Coal Supply Agreement were signed in October 2013 by relevant parties including the Government of Sri Lanka, the Ceylon Electricity Board and the Trincomalee Power Company Limited. The power station was originally expected to commence operation in late 2017.
good for all those small private power stations .They can mint a lot of money now charging exorbitant rates to the CEB which will have to pay them or face blackouts.Even then blackouts are inevitable and when they come i will be hightailing it out of the country.Dual citizenship has advantages. Good decision. Now release Army from north. and they are not in a hurry to leave. They are the cause of all that is wrong in the areas of the NPC and EPC. The C-in-C knows, but his political survival takes precedence over the travails of the people of the two PCs. He knows that he and his political gang/mixture of many parties wont get a single vote at the next election – like those which made him President. Army will never be realeased from north or south east or west. The year was 1999. The country was approaching a severe shortage of power generating capacity, with blackouts in the horizon. Engineers had previously planned to build major power plants to be operational by 1992, but their plans had been repeatedly thrown out of balance. President 1 did his best to build the power plant at Trincomalee, but failed; President 2 pushed it to the South, while his Energy Minister scuttled a tender for a stop-gap diesel power plant, which finally resulted in the severe blackouts of 1996. Then in 1994, the Secretary Finance to President 2, pushed the site again, this time to Puttalam. The merry go round from Trincomalee to Matara to Puttalam took five years to move from one location to another, while building oilpower plants in the interim, to meet the growing demand for electricity. So what happened in 1999 ? President 4 was in power, but the Catholic church and environmental NGOs were breathing fire on the President. Instead of getting independent advice, the President refused to send the request to Japan to finance the Norochcholai power plant project. President 4 continued into the 21st century, and was co-habiting with Prime Minister, when the project came up again for approval for Japanese funding. Can anyone guess the cost of the PM’s slap on the Japanese Ambassador and the people of Sri Lanka and its impact on the economy? The damage was in excess of four billion dollars to the economy, over 2004 -2014, the period over which the Norochcholai power plant was scheduled to be fully operational. What were the four billion dollars spent on? To provide jobs and to set up industries? No! It was to burn oil in emergency and short-term power plant contracts with the private suppliers, to serve the demand for electricity, while the politicians continued with their ball games with power plants. Who paid those extra four billion dollars? You, the electricity customers! Were the four billion dollars invested in power plants or to a useless airport? Oh, no, that was to burn diesel until the politicians finally ended their ball game over the Norochcholai power plant with the power plant completed in 2014. In 2005, President 5 finally decided to build the power plant, this time with Chinese funds, and he literally ended up buying a Chinese product at a Japanese price. Terms of interest on the Chinese loan were reportedly several times the interest on the Japanese loan that Prime Minister had rejected in 2002. The power plant was built and brought into operation by 2014. The church which some feared would be destroyed is sitting pretty and holy, 11 km north of the power plant. Fish that were to be dead and floating because of the power plant, are doing fine! Additional security staff that was to harass the locals, are playing real games with the locals. The Kalpitiya peninsula has a brand new highway. Electricity customers all over Sri Lanka who were paying Rs. 23 for a unit of electricity in 2013, have now been getting it for Rs 15, since 2015. That is approximately the benefit of the Norochcholai project. If you do not believe, read the annual electricity costs published by the Public Utilities Commission. Also read the annual reports of CEB and LECO. So what about the future? Your government over the past 12 months, has cancelled almost all power plants that were in the process of being built, to serve the growing demand. The Sampur Power Plant, scheduled as of April 2015, to be operational by end 2020, has now been effectively cancelled. How? Someone succeeded in getting President 6 to ask Prime Minister Mody to change the fuel of the Sampur Power Plant from coal to liquefied natural gas (LNG). With no analysis of the implications, with no idea of the economic loss to the country that is already broke, with no calculation on how the electricity demand would be served until the ball game with Sampur comes to an end, with absolutely no idea of the impacts on the electricity system and the cost to customer, the request was submitted to Prime Minister Mody, who, in his wisdom, did not make a commitment but agreed to “consider” it. Of course, India may consider the request as another extended business opportunity; nothing wrong with that. India has so far very clearly said that a change in fuel, would cause a delay of 7-8 years. The job of providing electricity to Sri Lanka in the meantime is not India’s responsibility. So, the present power plant ball game team scored their first goal on May 15, 2016, by buckling the ongoing power plant project at Sampur. The latest of the ball game is to build three LNG terminals in the country in Colombo, Hambantota and Trincomalee. India, for her 1,300 million people, so far has only 3 LNG terminals! Sri Lanka, for her 20 million, is going to have not one but three terminals. Who says so? The politicians. Do the Economists say so? No! Do engineers say so? No! The end result? Not a single LNG terminal, but a few diesel power plants. Very soon there will be a press statement about a power plant with “Natural gas” label, but we have no natural gas. So, it will run on diesel, and produce electricity at four times the fuel price at Sampur. That electricity will be sold to you, the electricity customers. So get ready! The era of sickening blackouts may be back sooner than you think. Higher electricity prices to pay for diesel, in the government’s desperate attempts to bridge the gap between supply and demand, will soon push the electricity costs up. Whether increasing costs will be passed on to electricity customers as higher prices is to be seen. As experience of 1999 and 2003 have shown, the government is most likely to say some time in 2018, “Do not worry, citizens, we will pay the fuel bill” as if the “government’s money were not people’s money. Then there will have to be further tax hikes, higher VAT perhaps, to pay for diesel to bridge the gap created by the absence of the Sampur power plant, and finally, a hike in electricity prices, as well. When the government runs out of money and options, then there will be blackouts. So, as we have seen in the run-up to the blackouts of 1996 and during 2000-2001 and 2004-5, governments tend to play ball games with power plants that tendency has become manifest again. The game is the same; interestingly, the players this time are also the same as those in the (i) 1993 power plant ball games Round 1 and the (ii) 2002-2004 power plant ball games Round 3. Between 1992 and 1994, the power plant ball game team was called the “Power Committee”, set up at the Ministry of Finance. It also had an appendix called Secretariat of Infrastructure Development and Investment (SIDI). From 1995 to 2001, the power plant ball game team was called the “Power Committee”, set up at the Board of Investment. From 2002-2004, there was a Committee called “Energy Supply Committee”. Now in 2016, the power plant ball game team is called “Committee on Economic Affairs”, sitting at the Ministry of National Policy and Economic Affairs. This Committee has certainly commenced its ball games with power plants, issues orders to Ministry of Power and Renewable Energy, ridicules engineers and economists, says their calculations are wrong, and keeps throwing the planning reports into the dustbin until the type of power plant it wants, their friends want, comes their way. If it does not, then it will run away by 2020, after trying for five years. The result of these power plant ball games will be the same as before, and the sure loser will be you, the electricity customer. Make no mistake, blackouts in 2018 are almost certain. Look at your electricity bill today, and keep it. Then look at your electricity bill in 2020. And if you care to keep this article together with your electricity bill, you will also know who was responsible for higher prices and blackouts. Follow the sequence, now all too familiar to anyone with a memory: (1) Ridicule planners, plans, engineers and economists,(2) announce everything else to produce electricity is cheaper than what is given in the long term plans and the power plant projects in progress,(3) cancel all power plant projects of any significance, (4) fill newspapers with headlines saying that there are so many cheaper proposals at BoI and elsewhere to build power plants of various description, (5) announce bids for diesel power plants, also offer to buy renewables at prices even higher than diesel, (6) blackouts, (7) price increases and (8) temporary diesel power plants become permanent. The government has currently reached Step 4; Step 5 will come very soon. Steps 6, 7 and 8 will follow! Congratulations. In addition to the land pollution, there is mercury and other heavy metal pollution, from coal, that will also poison the fish in the sea, that will ultimately up up in the people and lead t neurological disorders. Ask them to go solar and wind.Let every house have solar panel on its roof. Fish and shellfish concentrate mercury in their bodies, often in the form of methylmercury, a highly toxic organic compound of mercury. Fish products have been shown to contain varying amounts of heavy metals, particularly mercury and fat-soluble pollutants from water pollution. Species of fish that are long-lived and high on the food chain, such as marlin, tuna, shark, swordfish, king mackerel, tilefish (Gulf of Mexico), and northern pike, contain higher concentrations of mercury than others. Mercury is known to bioaccumulate in humans, so bioaccumulation in seafood carries over into human populations, where it can result in mercury poisoning. Mercury is dangerous to both natural ecosystems and humans because it is a metal known to be highly toxic, especially due to its ability to damage the central nervous system. In human-controlled ecosystems of fish, usually done for market production of wanted seafood species, mercury clearly rises through the food chain via fish consuming small plankton, as well as through non-food sources such as underwater sediment. This mercury grows in concentration within the bodies of fish and can be measured in the tissues of selected species. The presence of mercury in fish can be a particular health concern for women who are or may become pregnant, nursing mothers, and young children. All over the world, the governments are abolishing coal power stations, diesel vehicles and other polluting items and we backward people use all discarded outdated things. Sky is the limit for our stupidity – we torture and kill people and enjoy. We can not blame few politicians for our junk state because majority of us support them – Tamils are not very good people either – they killed each other during our own struggle. LTTE should feel shame for sacrificing their life for Tamils who are not trust worthy. God bless our country and our people. india or china and even the US,these three being the biggest polluters on the planet are not scuttling coal power plants,on the contrary china has put up about two every week for many years.I agree with what is being said that it should not be in sampur which has tourist potential and also LNG is cleaner than coal.My grouse is with the delay.From 2006 we are talking about this plant. put up the cheapest,fastest plant in the most environmentally and port wise most suitable place in the country(eg hambantota)and get on with it quickly with less talk,talk and more talk because we can’t afford any more time wasted.we can ill afford further delay when we are ranked no 61 for quality of electricity supply,while hong kong and singapore are 2 and 3 respectively.How come 2 ‘cities’, with 1000 sq,km and 700 sq,km are able to have excellent electricity supply while we with 65000 sq,km are talking and talking from 2006 about a plant.It shows that we are talkers while they are workers. i’am sick of talking of HK and singapore because we will be like them only in our dreams.lets go down a peg or two without dreaming with a people who have plenty of hot air emanating from their mouths the whole day,and look at czeck republic ranked 19th,slovak republic 26,both east asian small countries,taiwan 28th,the most similar looking country to us,an island half our size with two million more people next to a giant neighbour ,israel 33,showing how to even create electricity in a desert,slovenia 32,uruguay 35(bet most srilankans have not heard of it and might think it is a frog(gemba),malaysia 36,oh my god bhutan 37,hungary 39,croatia 40,costa rica 41,estonia 42,latvia 43,lithuania 44,mauritius 45,chile 46,guatemala 49,trinidad 50. megapolis,my foot. typho. czeck and slovak republics should be east european,not asian. Instead, they should build it in Hambanthota. for once i agree with you,since the highways are only used by buffaloes now. they should put up a petroleum refinery also there quickly. i’am also thinking why we can’t dump our garbage there.If we buy a old vessel and put the garbage in colombo port and take to every week to hambantota port and from there dump it 10 km away,instead of putting it in kollonawa which has 650000 residents,much more than hambantota.Also we could build a prison there and transfer the prisoners and use the current land for commercial purposes. I am happy for those people from Sampur,an ancient self-sufficient Tamil village in the Trinco:district. Of-course,India wanting to establish a Power plant is for other reasons?! Why only part of the island ? Is it not the whole country is Tamil homeland ? in their written statements. Truth of it, the magistrates will decide. The Govt. should also authorise the judiciary to revisit the old cases and see whether justice was rightly served. in that country and it is strange that they never warned the SL.Govt. about environmental concerns and hazards but funded and signed the contract to build the plant with no respect for human lives. God saved the people of Sampur from extinction. I think, probably Tamils have paid CEB engineers to scuttle the project. 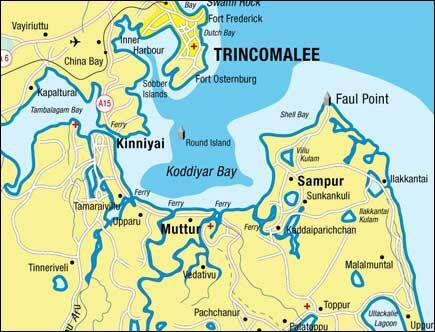 Because of the Trincomalee harbour this looks like prime real estate for industry. Eventually, it will become Tamil properties.